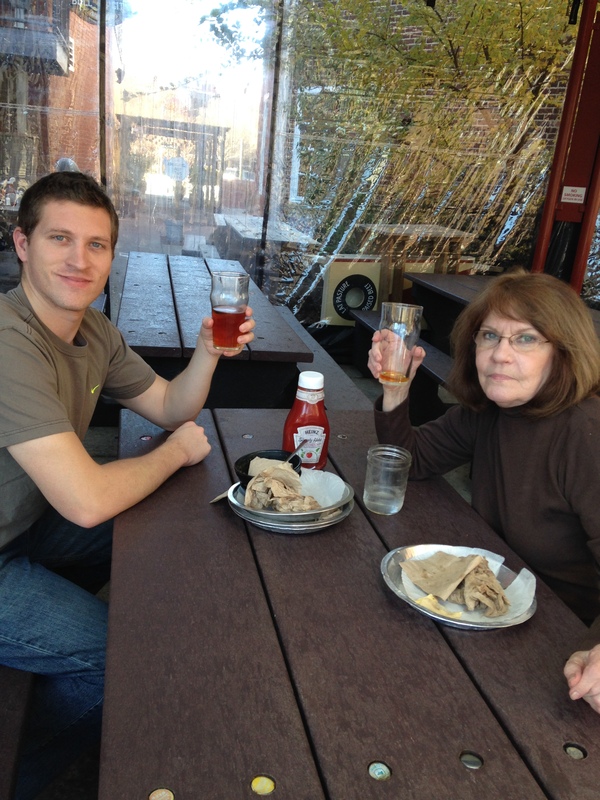 Zach, Mom and I spent an afternoon brew pub hopping in Durham last month. My 73 year old mom was the designated driver because she doesn’t start drinking until the evening. Zach and I don’t have those parameters. Durham is a small town with a lot of people. 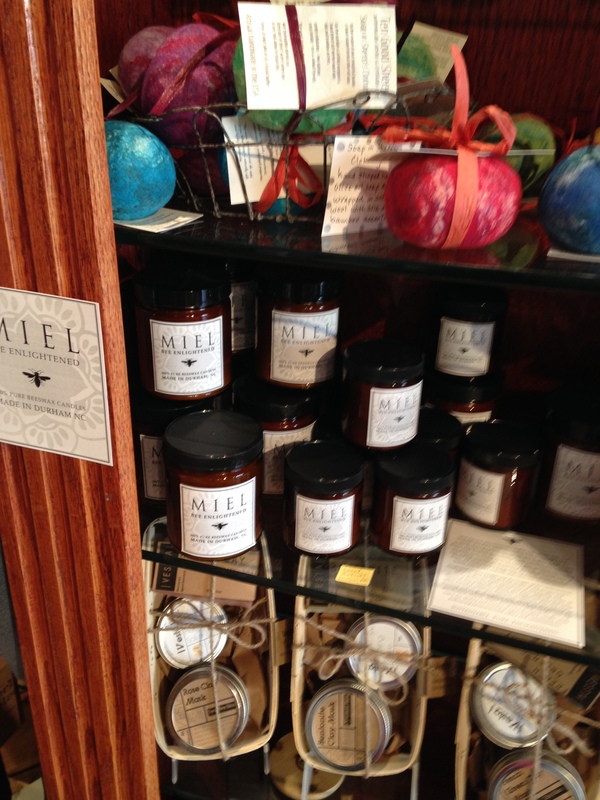 There are little hole in the wall businesses everywhere in Durham; all with their own personalities, selling everything from locally crafted beers, to homemade cupcakes, to shops with local artist made jewelry and locally made beeswax candles. Durham is maybe the coolest little town there is and it’s kind of a secret. Only the truly adventurous will wander into an old garage building and find themselves with the best cup of tea they’ve ever had or a most delicious vegetarian perfectly southern meal placed before them or find themselves in a yoga class. Eclectic squared would be a good description of Durham. They also have their fair share of craft breweries. We’re driving around Durham in mom’s car looking for the next brew pub with the google maps lady giving directions. “in a quarter mile turn right onto Irwin Street”. Zach and I “NO! RIGHT ,RIGHT”. Google Map lady speaks next and she is so polite. She just redirects never indicating that we made a wrong turn. We drove by the Methodist Church eight times that day . We find the brewery and it doesn’t open until four. Back to the google maps lady. We drive by the Methodist Church to the next brewery which is only the facility for making the beer, the tasting room is back on Main Street. Google map lady again. Go by the Methodist Church. There’s not a lot of parking in this town, but mom is able to save the day. Handicap Parking Permit! Mom’s new knee got her one handicap parking permit. Doesn’t make sense to me. She needed the handicap parking permit with her old worn out knee. They should make her park on the next block with her new bionic knee. Reminds me of both times Hannah dislocated her shoulder, she went to the emergency room, they put it back in and gave her some great pain drugs. She didn’t need them now. Her shoulder’s back where it belongs. An afternoon of brewery hopping with my mom and son and parking in the handicap parking. We were also in charge of dinner since Meg, Hannah and Dean were all working. Google lady, Methodist Church, Whole Foods, Google Lady, Methodist Church, back to Meg and Dean’s. Oh holy cow I forgot the best part of this story. Before we left the house I realized that we did not have a key to lock up. Think, Think. We locked up the house from the inside. Opened the garage door, hit the shut garage door button, ran through the garage, ducked the shutting door while at the same time jumping the electronic eye Indiana Jones style. If the handicap parking permit people hear this story they will revoke mom’s permit. What did we talk about on our day together? I know what we did not talk about. The ending of mom’s life. Crass? Yes. But no one talks about this. This is the societal elephant in the room. What is our fear? Death or hanging on to life? What is life and where do we draw the line? That’s our fear and so therefore we do not talk about it. We should. We should be discussing what are you going to want when you are not able to make a decision and we have to make it for you. I just finished the book “Being Mortal: Medicine and What Matters in the End” by Atul Gawande. Atul Gawande is a doctor who experiences life’s ending and how families deal with the logistics, nursing homes, home health care, and family responsibilities on a regular basis. In this book he uses his own personal experience with his father’s end of life story. This is now required reading if you are a follower of Wild About Books. People do not want to spend thousands and thousands of dollars on ultra fantastic bypass stint open heart surgery so that they can live for two more months recovering and on mind numbing pain drugs. They want autonomy. They want to be with family and play cards and have a beer. This affects everyone. 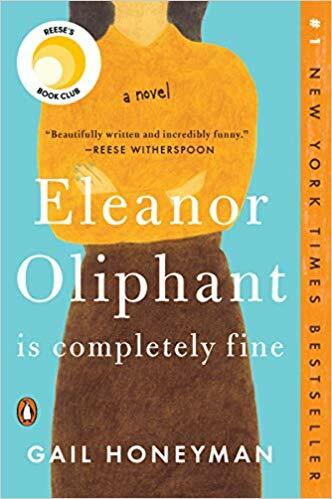 Please read this book no matter what your age. We need to address this. It is a big issue that should be talked about. Who picked this subject on Christmas Day? Go snowboarding. Next post is the January book selection; I promise. Click here to see more Wild About Books Posts. I thought most of this was so funny. You do humor quite well. I think you should rework it so it will be just about our tour around Durham and your description of the town. Send it to the Durham paper or the Chamber of Commerce or someplace that might use it. If you ever want to talk about elephants with me it doesn’t need to be tiptoed around. If that is a picture of you son and mom, I have to say she doesn’t look like she needs a handicap sticker nor does she look like she is at death’s door. Just a comment by an anonymous bystander. Some really nice lady let me use her computer to make my comment.